SLAC and its collaborators are transforming the way new materials are discovered. In a new report, they combine artificial intelligence and accelerated experiments to discover potential alternatives to steel in a fraction of the time. The research group took advantage of a system at SLAC’s Stanford Synchrotron Radiation Lightsource (SSRL) that combines machine learning – a form of artificial intelligence where computer algorithms glean knowledge from enormous amounts of data – with experiments that quickly make and screen hundreds of sample materials at a time. This allowed the team to discover three new blends of ingredients that form metallic glass, and to do this 200 times faster than it could be done before, they reported today in Science Advances. The ultimate goal, he said, is to get to the point where a scientist could scan hundreds of sample materials, get almost immediate feedback from machine learning models and have another set of samples ready to test the next day – or even within the hour. There’s plenty of room to make the process even speedier, he added, and eventually automate it to take people out of the loop altogether so scientists can concentrate on other aspects of their work that require human intuition and creativity. “This will have an impact not just on synchrotron users, but on the whole materials science and chemistry community,” Mehta said. The team said the method will be useful in all kinds of experiments, especially in searches for materials like metallic glass and catalysts whose performance is strongly influenced by the way they’re manufactured, and those where scientists don’t have theories to guide their search. With machine learning, no previous understanding is needed. The algorithms make connections and draw conclusions on their own, and this can steer research in unexpected directions. The paper is the first scientific result associated with a DOE-funded pilot project where SLAC is working with a Silicon Valley AI company, Citrine Informatics, to transform the way new materials are discovered and make the tools for doing that available to scientists everywhere. Founded by former graduate students from Northwestern and Stanford University, Citrine has created a materials science data platform where data that had been locked away in published papers, spreadsheets and lab notebooks is stored in a consistent format so it can be analyzed with AI specifically designed for materials. Until recently, thinking up, making and assessing new materials was painfully slow. For instance, the authors of the metallic glass paper calculated that even if you could cook up and examine five potential types of metallic glass a day, every day of the year, it would take more than a thousand years to plow through every possible combination of metals. When they do discover a metallic glass, researchers struggle to overcome problems that hold these materials back. Some have toxic or expensive ingredients, and all of them share glass’s brittle, shatter-prone nature. Over the past decade, scientists at SSRL and elsewhere have developed ways to automate experiments so they can create and study more novel materials in less time. Today, some SSRL users can get a preliminary analysis of their data almost as soon as it comes out with AI software developed by SSRL in conjunction with Citrine and the CAMERA project at DOE’s Lawrence Berkeley National Laboratory. 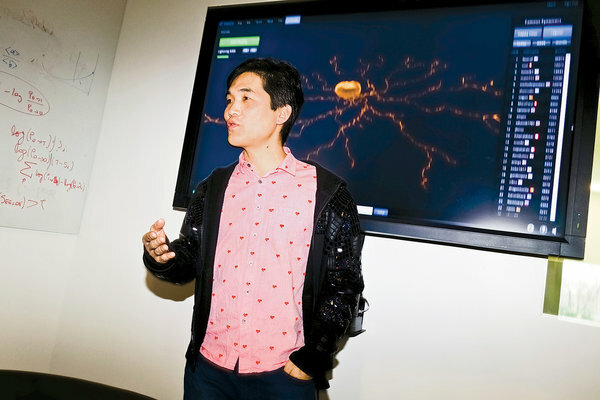 “With these automated systems we can analyze more than 2,000 samples per day,” said Fang Ren, the paper’s lead author, who developed algorithms to analyze data on the fly and coordinated their integration into the system while a postdoctoral scholar at SLAC. They started with a trove of materials data dating back more than 50 years, including the results of 6,000 experiments that searched for metallic glass. The team combed through the data with advanced machine learning algorithms developed by Wolverton and graduate student Logan Ward at Northwestern. Based on what the algorithms learned in this first round, the scientists crafted two sets of sample alloys using two different methods, allowing them to test how manufacturing methods affect whether an alloy morphs into a glass. Both sets of alloys were scanned by an SSRL X-ray beam, the data fed into the Citrine database, and new machine learning results generated, which were used to prepare new samples that underwent another round of scanning and machine learning. By the experiment’s third and final round, Mehta said, the group’s success rate for finding metallic glass had increased from one out of 300 or 400 samples tested to one out of two or three samples tested. The metallic glass samples they identified represented three different combinations of ingredients, two of which had never been used to make metallic glass before. In 1923, the year that Walter Pitts was born, a 25-year-old Warren McCulloch was also digesting the Principia. But that is where the similarities ended—McCulloch could not have come from a more different world. Born into a well-to-do East Coast family of lawyers, doctors, theologians, and engineers, McCulloch attended a private boys academy in New Jersey, then studied mathematics at Haverford College in Pennsylvania, then philosophy and psychology at Yale. In 1923 he was at Columbia, where he was studying “experimental aesthetics” and was about to earn his medical degree in neurophysiology. But McCulloch was a philosopher at heart. He wanted to know what it means to know. [Sigmund]Freud had just published The Ego and the Id, and psychoanalysis was all the rage. McCulloch didn’t buy it—he felt certain that somehow the mysterious workings and failings of the mind were rooted in the purely mechanical firings of neurons in the brain. Though they started at opposite ends of the socioeconomic spectrum, McCulloch and Pitts were destined to live, work, and die together. Along the way, they would create the first mechanistic theory of the mind, the first computational approach to neuroscience, the logical design of modern computers, and the pillars of artificial intelligence [AI]. But this is more than a story about a fruitful research collaboration. It is also about the bonds of friendship, the fragility of the mind, and the limits of logic’s ability to redeem a messy and imperfect world. The following June, 1945, von Neumann penned what would become a historic document entitled First Draft of a Report on the EDVAC, the first published description of a stored-program binary computing machine—the modern computer. The EDVAC’s predecessor, the ENIAC, which took up 1,800 square feet of space in Philadelphia, was more like a giant electronic calculator than a computer. It was possible to reprogram the thing, but it took several operators several weeks to reroute all the wires and switches to do it. 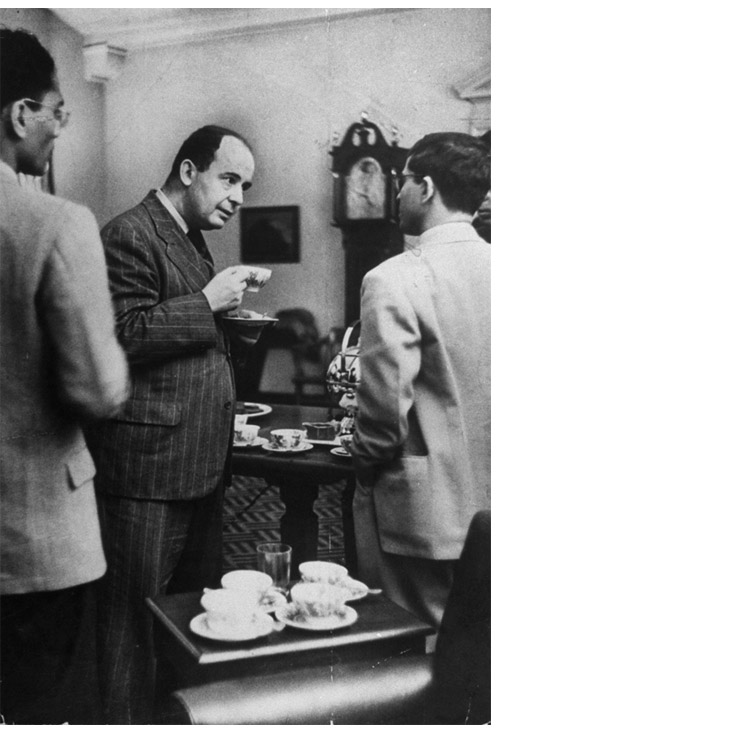 Von Neumann realized that it might not be necessary to rewire the machine every time you wanted it to perform a new function. If you could take each configuration of the switches and wires, abstract them, and encode them symbolically as pure information, you could feed them into the computer the same way you’d feed it data, only now the data would include the very programs that manipulate the data. Without having to rewire a thing, you’d have a universal Turing machine. Together with Pitts, McCulloch and the Chilean biologist and philosopher Humberto Maturana, he subjected the frogs to various visual experiences—brightening and dimming the lights, showing them color photographs of their natural habitat, magnetically dangling artificial flies—and recorded what the eye measured before it sent the information off to the brain. To everyone’s surprise, it didn’t merely record what it saw, but filtered and analyzed information about visual features like contrast, curvature, and movement. 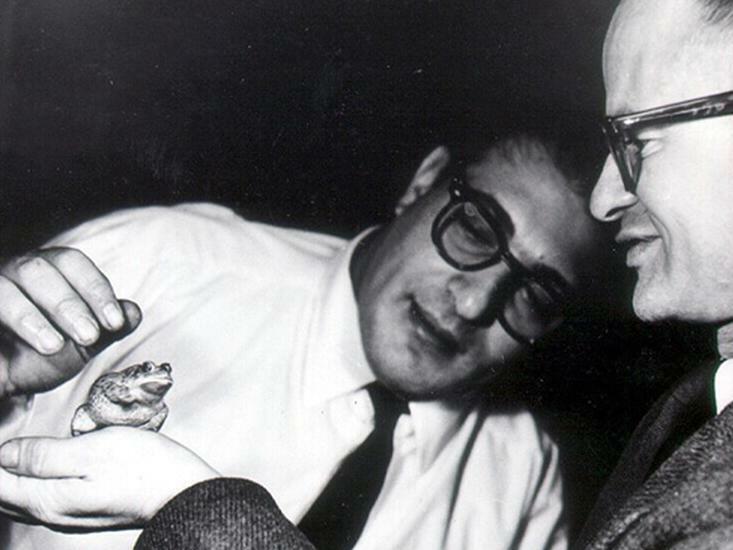 “The eye speaks to the brain in a language already highly organized and interpreted,” they reported in the now-seminal paper What the Frog’s Eye Tells the Frog’s Brain, published in 1959. A group of prominent Silicon Valley investors and technology companies said on Friday that they would establish an artificial-intelligence research center to develop “digital intelligence” that will benefit humanity. The organization, to be named OpenAI, will be established as a nonprofit, and will be based in San Francisco. Its long-range goal will be to create an “artificial general intelligence,” a machine capable of performing any intellectual task that a human being can, according to Mr. Musk. He also stressed that the focus was on building technologies that augment rather than replace humans. 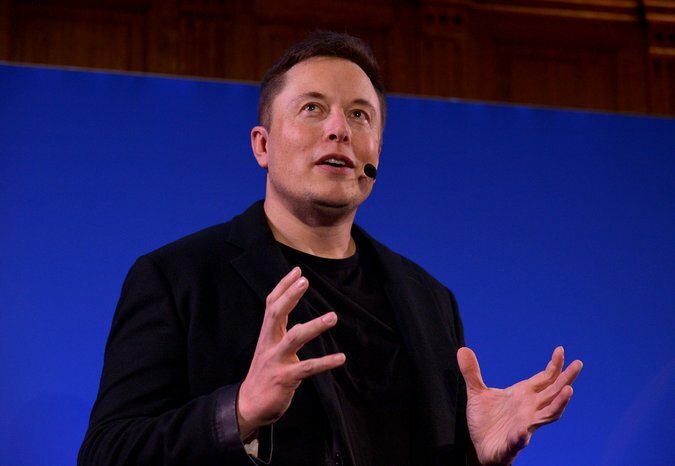 Mr. Musk, who is deploying A.I.-based technologies in some of his products like the Tesla automobile, said that he has had longstanding concerns about the possibility that artificial intelligence could be used to create machines that might turn on humanity. He began discussing the issue this year with Mr. Hoffman, Mr. Thiel and Sam Altman, president of the Y Combinator investment group. Other backers of the project include Jessica Livingston of Y Combinator; Greg Brockman, the former chief technology officer of Stripe, as well as Amazon Web Services, Amazon’s Cloud Services subsidiary; and Infosys, an Indian software consulting and consulting firm. The research effort has also attracted a group of young artificial intelligence researchers. The founders said they were not yet ready to provide details on who had donated how much and the rate at which the project money would be spent. They will fund the development of the project on a year-by-year basis. They also said they were not yet ready to describe how quickly the project would grow in terms of funding or staffing. The announcement occurs in the same week that one of the main academic gatherings focusing on artificial intelligence, the Conference on Neural Information Processing Systems, is being held in Montreal. In recent years the event has grown as major technology corporations like Apple, Facebook, Google, IBM and Microsoft have started competing to hire the most talented researchers in the field. Salaries and hiring incentives have soared. The research director of OpenAI will be Ilya Sutskever, a Google expert on machine learning. Mr. Brockman will be the chief technology officer. The group will begin with seven researchers, including graduate researchers who have been standouts at universities like Stanford, the University of California, Berkeley, and New York University. “The people on the team have all been offered substantially more to work at other places,” Mr. Musk said. In October, he donated $10 million to the Future of Life Institute, a Cambridge, Mass., organization focused on developing positive ways for humanity to respond to challenges posed by advanced technologies. He said the new organization would be separate from the Future of Life Institute, and that while the new organization did have a broad research plan, it was not yet ready to offer a specific road map. Mr. Musk said he remained concerned that A.I. advances might work against, rather than benefit, humanity. “There is always some risk that in actually trying to advance A.I. we may create the thing we are concerned about,” he said. In the last two years there has been a race to set up research facilities focused both on advancing A.I. and in assessing its impact. Also in 2014, the Microsoft A.I. researcher Eric Horvitz gave an undisclosed amount as a gift to Stanford to study the impact of the technology over the next century. Last month, the Toyota Corporation said that it would invest $1 billion in a five-year research effort in artificial intelligence and robotics technologies to be based in a laboratory near Stanford. When it comes to artificial intelligence [AI], we may all be suffering from the fallacy of availability: thinking that creating intelligence is much easier than it is, because we see examples all around us. 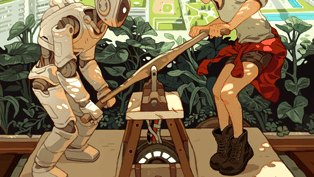 In a recent poll, machine intelligence experts predicted that computers would gain human-level ability around the year 2050, and superhuman ability less than 30 years after.1 But, like a tribe on a tropical island littered with World War II debris imagining that the manufacture of aluminum propellers or steel casings would be within their power, our confidence is probably inflated. The potential for improved human intelligence is enormous. Cognitive ability is influenced by thousands of genetic loci, each of small effect. If all were simultaneously improved, it would be possible to achieve, very roughly, about 100 standard deviations [Σ] of improvement, corresponding to an IQ of over 1,000. We can’t imagine what capabilities this level of intelligence represents, but we can be sure it is far beyond our own. Cognitive engineering, via direct edits to embryonic human DNA, will eventually produce individuals who are well beyond all historical figures in cognitive ability. By 2050, this process will likely have begun. It has happened before. It is easy to forget that the computer revolution was led by a handful of geniuses: individuals with truly unusual cognitive ability. Alan Turing and John von Neumann both contributed to the realization of computers whose program is stored in memory and can be modified during execution. This idea appeared originally in the form of the Turing Machine, and was given practical realization in the so-called von Neumann architecture of the first electronic computers, such as the EDVAC. While this computing design seems natural, even obvious, to us now, it was at the time a significant conceptual leap. You could give an argument that something like this has happened in quite a few fields … I think it has happened in physics and mathematics, for example … In talking to students at MIT, I notice that many of the very brightest ones, who would have gone into physics twenty years ago, are now going into biology. I think part of the reason for this shift is that there are discoveries to be made in biology that are within the range of an intelligent human being. This may not be true in other areas. … in neural networks there are large numbers of parameters and hyper-parameters, and extremely complex interactions between them. In such extraordinarily complex systems it’s exceedingly difficult to establish reliable general statements. Understanding neural networks in their full generality is a problem that, like quantum foundations, tests the limits of the human mind. 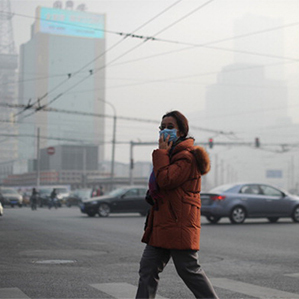 A woman wearing a face mask makes her way along a street in Beijing on January 16, 2014. 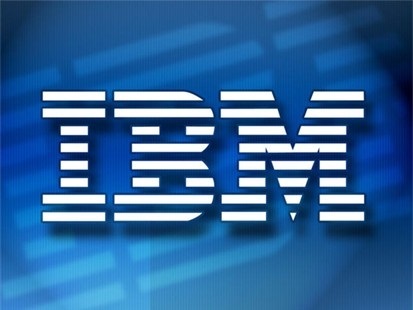 The project, dubbed Green Horizon, is an example of how broadly IBM hopes to apply its research on using advanced machine learning to extract insights from huge amounts of data—something the company calls “cognitive computing.” The project also highlights an application of the technology that IBM would like to export to other countries where pollution is a growing problem. IBM is currently pushing artificial intelligence in many different industries, from health care to consulting. The cognitive computing effort encompasses natural language processing and statistical techniques originally developed for the Watson computer system, which competed on the game show Jeopardy!, along with many other approaches to machine learning (see “Why IBM Just Bought Millions of Medical Images” and “IBM Pushes Deep Learning with a Watson Upgrade”). Predicting pollution is challenging. IBM uses data supplied by the Beijing Environmental Protection Bureau to refine its models, and Shen says the predictions have a resolution of a kilometer and are 30 percent more precise than those derived through conventional approaches. He says the system uses “adaptive machine learning” to determine the best combination of models to use. Pollution is a major public health issue in China, accounting for more than a million deaths each year, according to a study conducted by researchers at the University of California, Berkeley. It is also a major subject of public and political debate. China has committed to improving air quality 10 percent by 2017 through the Airborne Pollution Prevention and Control Action Plan. This past April, an analysis of 360 Chinese cities by the charity Greenpeace East Asia, based in Beijing, showed that 351 of them had pollution levels exceeding China’s own air quality standards, although levels had improved since the period 12 months before. The average level of airborne particulates measured was more than two and a half times the limit recommended by the World Health Organization. The first time Yann LeCun revolutionized artificial intelligence, it was a false dawn. It was 1995, and for almost a decade, the young Frenchman had been dedicated to what many computer scientists considered a bad idea: that crudely mimicking certain features of the brain was the best way to bring about intelligent machines. But LeCun had shown that this approach could produce something strikingly smart—and useful. Working at Bell Labs, he made software that roughly simulated neurons and learned to read handwritten text by looking at many different examples. Bell Labs’ corporate parent, AT&T, used it to sell the first machines capable of reading the handwriting on checks and written forms. To LeCun and a few fellow believers in artificial neural networks, it seemed to mark the beginning of an era in which machines could learn many other skills previously limited to humans. It wasn’t. “This whole project kind of disappeared on the day of its biggest success,” says LeCun. On the same day he celebrated the launch of bank machines that could read thousands of checks per hour, AT&T announced it was splitting into three companies dedicated to different markets in communications and computing. LeCun became head of research at a slimmer AT&T and was directed to work on other things; in 2002 he would leave Bell Labs, soon to become a professor at New York University. Meanwhile, researchers elsewhere found that they could not apply LeCun’s breakthrough to other computing problems. The brain-inspired approach to AI went back to being a fringe interest. LeCun, now a stocky 55-year-old with a ready smile and a sideways sweep of dark hair touched with gray, never stopped pursuing that fringe interest. And remarkably, the rest of the world has come around. The ideas that he and a few others nurtured in the face of over two decades of apathy and sometimes outright rejection have in the past few years produced striking results in areas like face and speech recognition. Deep learning, as the field is now known, has become a new battleground between Google and other leading technology companies that are racing to use it in consumer services. One such company is Facebook, which hired LeCun from NYU in December 2013 and put him in charge of a new artificial–intelligence research group, FAIR, that today has 50 researchers but will grow to 100. LeCun’s lab is Facebook’s first significant investment in fundamental research, and it could be crucial to the company’s attempts to become more than just a virtual social venue. It might also reshape our expectations of what machines can do. Facebook and other companies, including Google, IBM, and Microsoft, have moved quickly to get into this area in the past few years because deep learning is far better than previous AI techniques at getting computers to pick up skills that challenge machines, like understanding photos. Those more established techniques require human experts to laboriously program certain abilities, such as how to detect lines and corners in images. Deep-learning software figures out how to make sense of data for itself, without any such programming. Some systems can now recognize images or faces about as accurately as humans. Now LeCun is aiming for something much more powerful. He wants to deliver software with the language skills and common sense needed for basic conversation. Instead of having to communicate with machines by clicking buttons or entering carefully chosen search terms, we could just tell them what we want as if we were talking to another person. “Our relationship with the digital world will completely change due to intelligent agents you can interact with,” he predicts. He thinks deep learning can produce software that understands our sentences and can respond with appropriate answers, clarifying questions, or suggestions of its own. Agents that answer factual questions or book restaurants for us are one obvious—if not exactly world-changing—application. It’s also easy to see how such software might lead to more stimulating video-game characters or improve online learning. More provocatively, LeCun says systems that grasp ordinary language could get to know us well enough to understand what’s good for us. “Systems like this should be able to understand not just what people would be entertained by but what they need to see regardless of whether they will enjoy it,” he says. Such feats aren’t possible using the techniques behind the search engines, spam filters, and virtual assistants that try to understand us today. They often ignore the order of words and get by with statistical tricks like matching and counting keywords. Apple’s Siri, for example, tries to fit what you say into a small number of categories that trigger scripted responses. “They don’t really understand the text,” says LeCun. “It’s amazing that it works at all.” Meanwhile, systems that seem to have mastered complex language tasks, such as IBM’s Jeopardy! winner Watson, do it by being super-specialized to a particular format. “It’s cute as a demonstration, but not work that would really translate to any other situation,” he says. In contrast, deep-learning software may be able to make sense of language more the way humans do. Researchers at Facebook, Google, and elsewhere are developing software that has shown progress toward understanding what words mean. LeCun’s team has a system capable of reading simple stories and answering questions about them, drawing on faculties like logical deduction and a rudimentary understanding of time. However, as LeCun knows firsthand, artificial intelligence is notorious for blips of progress that stoke predictions of big leaps forward but ultimately change very little. Creating software that can handle the dazzling complexities of language is a bigger challenge than training it to recognize objects in pictures. Deep learning’s usefulness for speech recognition and image detection is beyond doubt, but it’s still just a guess that it will master language and transform our lives more radically. We don’t yet know for sure whether deep learning is a blip that will turn out to be something much bigger. The roots of deep learning reach back further than LeCun’s time at Bell Labs. He and a few others who pioneered the technique were actually resuscitating a long-dead idea in artificial intelligence. When the field got started, in the 1950s, biologists were just beginning to develop simple mathematical theories of how intelligence and learning emerge from signals passing between neurons in the brain. The core idea—still current today—was that the links between neurons are strengthened if those cells communicate frequently. The fusillade of neural activity triggered by a new experience adjusts the brain’s connections so it can understand it better the second time around. In 1956, the psychologist Frank Rosenblatt used those theories to invent a way of making simple simulations of neurons in software and hardware. The New York Times announced his work with the headline “Electronic ‘Brain’ Teaches Itself.” Rosenblatt’s perceptron, as he called his design, could learn how to sort simple images into categories—for instance, triangles and squares. 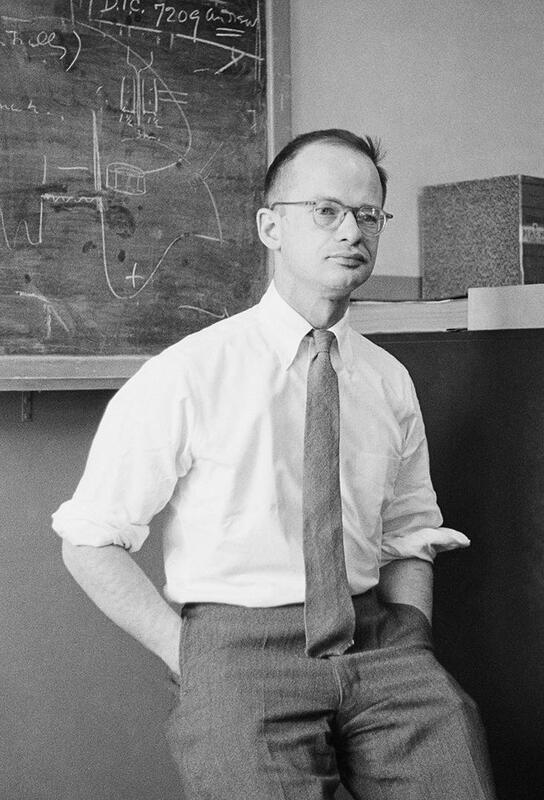 Rosenblatt usually implemented his ideas on giant machines thickly tangled with wires, but they established the basic principles at work in artificial neural networks today. One computer he built had eight simulated neurons, made from motors and dials connected to 400 light detectors. Each of the neurons received a share of the signals from the light detectors, combined them, and, depending on what they added up to, spit out either a 1 or a 0. Together those digits amounted to the perceptron’s “description” of what it saw. Initially the results were garbage. But Rosenblatt used a method called supervised learning to train a perceptron to generate results that correctly distinguished different shapes. He would show the perceptron an image along with the correct answer. Then the machine would tweak how much attention each neuron paid to its incoming signals, shifting those “weights” toward settings that would produce the right answer. After many examples, those tweaks endowed the computer with enough smarts to correctly categorize images it had never seen before. Today’s deep-learning networks use sophisticated algorithms and have millions of simulated neurons, with billions of connections between them. But they are trained in the same way. Rosenblatt predicted that perceptrons would soon be capable of feats like greeting people by name, and his idea became a linchpin of the nascent field of artificial intelligence. Work focused on making perceptrons with more complex networks, arranged into a hierarchy of multiple learning layers. Passing images or other data successively through the layers would allow a perceptron to tackle more complex problems. Unfortunately, Rosenblatt’s learning algorithm didn’t work on multiple layers. In 1969 the AI pioneer Marvin Minsky, who had gone to high school with Rosenblatt, published a book-length critique of perceptrons that killed interest in neural networks at a stroke. Minsky claimed that getting more layers working wouldn’t make perceptrons powerful enough to be useful. 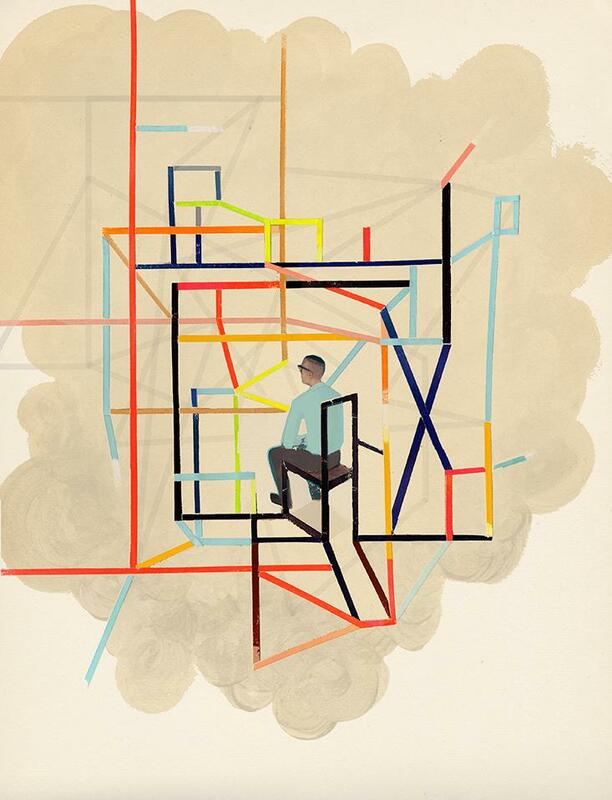 Artificial–intelligence researchers abandoned the idea of making software that learned. Instead, they turned to using logic to craft working facets of intelligence—such as an aptitude for chess. Neural networks were shoved to the margins of computer science. Nonetheless, LeCun was mesmerized when he read about perceptrons as an engineering student in Paris in the early 1980s. “I was amazed that this was working and wondering why people abandoned it,” he says. He spent days at a research library near Versailles, hunting for papers published before perceptrons went extinct. Then he discovered that a small group of researchers in the United States were covertly working on neural networks again. “This was a very underground movement,” he says. In papers carefully purged of words like “neural” and “learning” to avoid rejection by reviewers, they were working on something very much like Rosenblatt’s old problem of how to train neural networks with multiple layers. LeCun joined the underground after he met its central figures in 1985, including a wry Brit named Geoff Hinton, who now works at Google and the University of Toronto. They immediately became friends, mutual admirers—and the nucleus of a small community that revived the idea of neural networking. They were sustained by a belief that using a core mechanism seen in natural intelligence was the only way to build artificial intelligence. “The only method that we knew worked was a brain, so in the long run it had to be that systems something like that could be made to work,” says Hinton. LeCun’s success at Bell Labs came about after he, Hinton, and others perfected a learning algorithm for neural networks with multiple layers. It was known as backpropagation, and it sparked a rush of interest from psychologists and computer scientists. But after LeCun’s check-reading project ended, backpropagation proved tricky to adapt to other problems, and a new way to train software to sort data was invented by a Bell Labs researcher down the hall from LeCun. It didn’t involve simulated neurons and was seen as mathematically more elegant. Very quickly it became a cornerstone of Internet companies such as Google, Amazon, and LinkedIn, which use it to train systems that block spam or suggest things for you to buy. Everything changed six months later. Hinton and two grad students used a network like the one LeCun made for reading checks to rout the field in the leading contest for image recognition. Known as the ImageNet Large Scale Visual Recognition Challenge, it asks software to identify 1,000 types of objects as diverse as mosquito nets and mosques. The Toronto entry correctly identified the object in an image within five guesses about 85 percent of the time, more than 10 percentage points better than the second-best system. The deep-learning software’s initial layers of neurons optimized themselves for finding simple things like edges and corners, with the layers after that looking for successively more complex features like basic shapes and, eventually, dogs or people. Academics working on computer vision quickly abandoned their old methods, and deep learning suddenly became one of the main strands in artificial intelligence. Google bought a company founded by Hinton and the two others behind the 2012 result, and Hinton started working there part time on a research team known as Google Brain. Microsoft and other companies created new projects to investigate deep learning. In December 2013, Facebook CEO Mark Zuckerberg stunned academics by showing up at the largest neural-network research conference, hosting a party where he announced that LeCun was starting FAIR (though he still works at NYU one day a week). LeCun still harbors mixed feelings about the 2012 research that brought the world around to his point of view. “To some extent this should have come out of my lab,” he says. Hinton shares that assessment. “It was a bit unfortunate for Yann that he wasn’t the one who actually made the breakthrough system,” he says. LeCun’s group had done more work than anyone else to prove out the techniques used to win the ImageNet challenge. The victory could have been his had student graduation schedules and other commitments not prevented his own group from taking on ImageNet, he says. LeCun’s hunt for deep learning’s next breakthrough is now a chance to even the score. 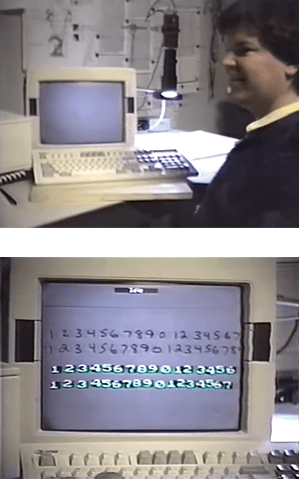 LeCun at Bell Labs in 1993, with a computer that could read the handwriting on checks. Facebook’s New York office is a three-minute stroll up Broadway from LeCun’s office at NYU, on two floors of a building constructed as a department store in the early 20th century. Workers are packed more densely into the open plan than they are at Facebook’s headquarters in Menlo Park, California, but they can still be seen gliding on articulated skateboards past notices for weekly beer pong. Almost half of LeCun’s team of leading AI researchers works here, with the rest at Facebook’s California campus or an office in Paris. Many of them are trying to make neural networks better at understanding language. “I’ve hired all the people working on this that I could,” says LeCun. A neural network can “learn” words by spooling through text and calculating how each word it encounters could have been predicted from the words before or after it. By doing this, the software learns to represent every word as a vector that indicates its relationship to other words—a process that uncannily captures concepts in language. The difference between the vectors for “king” and “queen” is the same as for “husband” and “wife,” for example. The vectors for “paper” and “cardboard” are close together, and those for “large” and “big” are even closer. The same approach works for whole sentences (Hinton says it generates “thought vectors”), and Google is looking at using it to bolster its automatic translation service. A recent paper from researchers at a Chinese university and Microsoft’s Beijing lab used a version of the vector technique to make software that beats some humans on IQ-test questions requiring an understanding of synonyms, antonyms, and analogies. LeCun’s group is working on going further. “Language in itself is not that complicated,” he says. “What’s complicated is having a deep understanding of language and the world that gives you common sense. That’s what we’re really interested in building into machines.” LeCun means common sense as Aristotle used the term: the ability to understand basic physical reality. He wants a computer to grasp that the sentence “Yann picked up the bottle and walked out of the room” means the bottle left with him. Facebook’s researchers have invented a deep-learning system called a memory network that displays what may be the early stirrings of common sense. The software learned its rudimentary common sense by being shown how to answer questions about a simple text in which characters do things in a series of rooms, such as “Fred moved to the bedroom and Joe went to the kitchen.” But LeCun wants to expose the software to texts that are far better at capturing the complexity of life and the things a virtual assistant might need to do. A virtual concierge called Moneypenny that Facebook is expected to release could be one source of that data. The assistant is said to be powered by a team of human operators who will help people do things like make restaurant reservations. LeCun’s team could have a memory network watch over Moneypenny’s shoulder before eventually letting it learn by interacting with humans for itself. Building something that can hold even a basic, narrowly focused conversation still requires significant work. For example, neural networks have shown only very simple reasoning, and researchers haven’t figured out how they might be taught to make plans, says LeCun. But results from the work that has been done with the technology so far leave him confident about where things are going. “The revolution is on the way,” he says. Some people are less sure. Deep-learning software so far has displayed only the simplest capabilities required for what we would recognize as conversation, says Oren Etzioni, CEO of the Allen Institute for Artificial Intelligence in Seattle. The logic and planning capabilities still needed, he says, are very different from the things neural networks have been doing best: digesting sequences of pixels or acoustic waveforms to decide which image category or word they represent. “The problems of understanding natural language are not reducible in the same way,” he says. Gary Marcus, a professor of psychology and neural science at NYU who has studied how humans learn language and recently started an artificial-intelligence company called Geometric Intelligence, thinks LeCun underestimates how hard it would be for existing software to pick up language and common sense. Training the software with large volumes of carefully annotated data is fine for getting it to sort images. But Marcus doubts it can acquire the trickier skills needed for language, where the meanings of words and complex sentences can flip depending on context. “People will look back on deep learning and say this is a really powerful technique—it’s the first time that AI became practical,” he says. “They’ll also say those things required a lot of data, and there were domains where people just never had enough.” Marcus thinks language may be one of those domains. For software to master conversation, it would need to learn more like a toddler who picks it up without explicit instruction, he suggests. At Facebook’s headquarters in California, the West Coast members of LeCun’s team sit close to Mark Zuckerberg and Mike Schroepfer, the company’s CTO. Facebook’s leaders know that LeCun’s group is still some way from building something you can talk to, but Schroepfer is already thinking about how to use it. The future Facebook he describes retrieves and coördinates information, like a butler you communicate with by typing or talking as you might with a human one. “You can engage with a system that can really understand concepts and language at a much higher level,” says Schroepfer. He imagines being able to ask that you see a friend’s baby snapshots but not his jokes, for example. “I think in the near term a version of that is very realizable,” he says. As LeCun’s systems achieve better reasoning and planning abilities, he expects the conversation to get less one-sided. Facebook might offer up information that it thinks you’d like and ask what you thought of it. “Eventually it is like this super-intelligent helper that’s plugged in to all the information streams in the world,” says Schroepfer. The algorithms needed to power such interactions would also improve the systems Facebook uses to filter the posts and ads we see. And they could be vital to Facebook’s ambitions to become much more than just a place to socialize. As Facebook begins to host articles and video on behalf of media and entertainment companies, for example, it will need better ways for people to manage information. Virtual assistants and other spinouts from LeCun’s work could also help Facebook’s more ambitious departures from its original business, such as the Oculus group working to make virtual reality into a mass–market technology. None of this will happen if the recent impressive results meet the fate of previous big ideas in artificial intelligence. Blooms of excitement around neural networks have withered twice already. But while complaining that other companies or researchers are over-hyping their work is one of LeCun’s favorite pastimes, he says there’s enough circumstantial evidence to stand firm behind his own predictions that deep learning will deliver impressive payoffs. The technology is still providing more accuracy and power in every area of AI where it has been applied, he says. New ideas are needed about how to apply it to language processing, but the still-small field is expanding fast as companies and universities dedicate more people to it. “That will accelerate progress,” says LeCun. 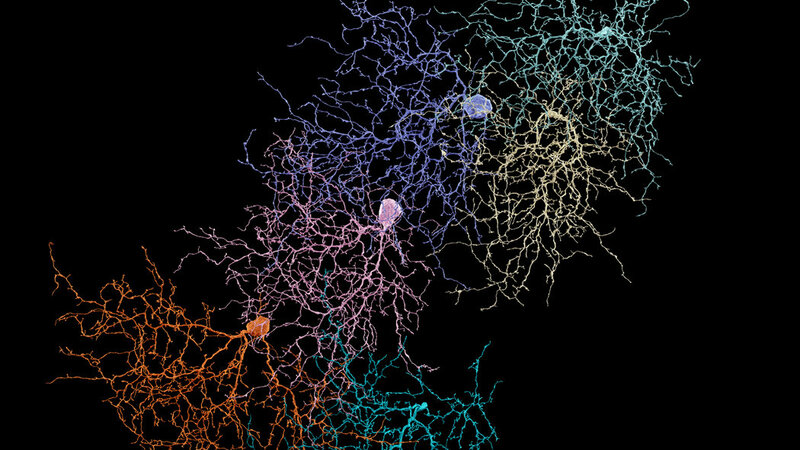 Several distinct neurons in a mouse retina that have been mapped by volunteers playing a game developed by Sebastian Seung. Credit Photo illustration by Danny Jones. Original images from EyeWire. With time, Borges’s cautionary parable has become even more relevant for the would-be cartographers of the world, Seung among them. Technological progress has always brought novel ways of seeing the natural world and thus new ways of mapping it. The telescope was what allowed Galileo [Galilei] to sketch, in his book “The Starry Messenger,” a first map of Jupiter’s largest moons. The invention of the microscope, sometime in the late 16th century, led to Robert Hooke’s famous depiction of a flea, its body armored and spiked, as well as the discovery of the cell, an alien world unto itself. Today the pace of invention and the raw power of technology are shocking: A Nobel Prize was awarded last fall for the creation of a microscope with a resolution so extreme that it seems to defy the physical constraints of light itself. The ur-map of this big science is the one produced by the Human Genome Project, a stem-to-stern accounting of the DNA that provides every cell’s genetic instructions. The genome project was completed faster than anyone expected, thanks to Moore’s Law, and has become an essential scientific tool. In its wake have come a proliferation of projects in the same vein — the proteome (proteins), the foldome (folding of proteins) — each promising a complete description of something or other. (One online listing includes the antiome: “The totality of people who object to the propagation of omes.”) The Brain Initiative3, the United States government’s 12-year, $4.5 billion brain-mapping effort, is a conscious echo of the genome project, but neuroscientists find themselves in a far more tenuous position at the outset. The brain might be mapped in a host of ways, and the initiative is pursuing many at once. In fact, Seung and his colleagues, who are receiving some of the funding, are working at the margins of contemporary neuroscience. Much of the field’s most exciting new technology has sought to track the brain’s activity — like functional M.R.I., with its images of parts of the brain “lighting up” — while the connectome would map the brain’s physical structure. Growing up, Seung’s primary passions were soccer, mathematics and nonfiction (with an exception made for Greek myths). As a teenager, he was inspired by Carl Sagan’s Cosmos. He took graduate-level physics courses as a 17-year-old Harvard sophomore and went directly into Harvard’s Ph.D. program in theoretical physics. During a 1989 summer internship at Bell Laboratories, though, Seung fell under the spell of a gregarious Israeli named Haim Sompolinsky, who introduced him to a problem in theoretical neuroscience: How can a network of neurons generate something like an “Aha!” moment, when learning leads to sudden understanding. This brought Seung to his own “Aha!” moment: At the fuzzy border between neuroscience and mathematics, he spied a new scientific terrain, thrilling and largely unexplored, giving him the same feeling physicists must have had when the atom first began to yield its secrets. 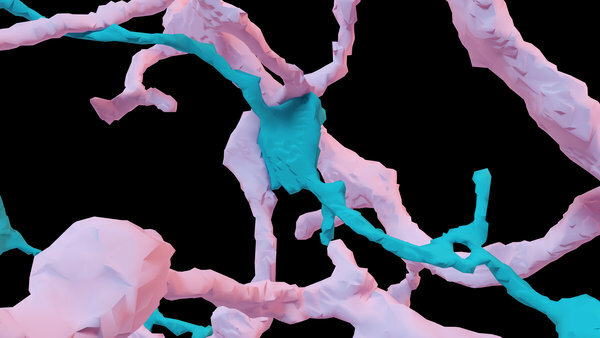 Two neurons, mapped by EyeWire players, making contact at a synapse. Credit Photo illustration by Danny Jones. Original images from EyeWire. It’s a Saturday morning in June at the Royal Society in London. Computer scientists, public figures and reporters have gathered to witness or take part in a decades-old challenge. Some of the participants are flesh and blood; others are silicon and binary. Thirty human judges sit down at computer terminals, and begin chatting. The goal? To determine whether they’re talking to a computer program or a real person. 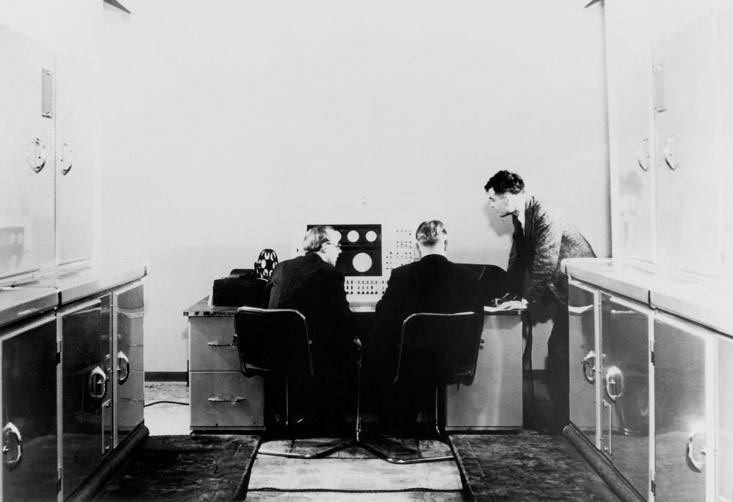 The event, organized by the University of Reading, was a rendition of the so-called Turing test, developed 65 years ago by British mathematician and cryptographer Alan Turing as a way to assess whether a machine is capable of intelligent behavior indistinguishable from that of a human. The recently released film The Imitation Game, about Turing’s efforts to crack the German Enigma code during World War II, is a reference to the scientist’s own name for his test. Decades of research and speculative fiction have led to today’s computerized assistants such as Apple’s Siri. When people think of artificial intelligence (AI) — the study of the design of intelligent systems and machines — talking computers like Eugene Goostman often come to mind. But most AI researchers are focused less on producing clever conversationalists and more on developing intelligent systems that make people’s lives easier — from software that can recognize objects and animals, to digital assistants that cater to, and even anticipate, their owners’ needs and desires. But several prominent thinkers, including the famed physicist Stephen Hawking and billionaire entrepreneur Elon Musk, warn that the development of AI should be cause for concern. The notion of intelligent automata, as friend or foe, dates back to ancient times. “The idea of intelligence existing in some form that’s not human seems to have a deep hold in the human psyche,” said Don Perlis, a computer scientist who studies artificial intelligence at the University of Maryland, College Park. Since the field of AI was officially founded in the mid-1950s, people have been predicting the rise of conscious machines, Perlis said. Inventor and futurist Ray Kurzweil, recently hired to be a director of engineering at Google, refers to a point in time known as “the singularity,” when machine intelligence exceeds human intelligence. Based on the exponential growth of technology according to Moore’s Law (which states that computing processing power doubles approximately every two years), Kurzweil has predicted the singularity will occur by 2045. Nevertheless, a number of prominent science and technology experts have expressed worry that humanity is not doing enough to prepare for the rise of artificial general intelligence, if and when it does occur. Earlier this week, Hawking issued a dire warning about the threat of AI. Fears of AI turning into sinister killing machines, like Arnold Schwarzenegger’s character from the “Terminator” films, are nothing new. But despite the fears of high-profile technology leaders, the rise of conscious machines — known as “strong AI” or “general artificial intelligence” — is likely a long way off, many researchers argue. “I don’t see any reason to think that as machines become more intelligent … which is not going to happen tomorrow — they would want to destroy us or do harm,” said Charlie Ortiz, head of AI at the Burlington, Massachusetts-based software company Nuance Communications.”Lots of work needs to be done before computers are anywhere near that level,” he said. Artificial intelligence is a broad and active area of research, but it’s no longer the sole province of academics; increasingly, companies are incorporating AI into their products. And there’s one name that keeps cropping up in the field: Google. From smartphone assistants to driverless cars, the Bay Area-based tech giant is gearing up to be a major player in the future of artificial intelligence. Google has been a pioneer in the use of machine learning — computer systems that can learn from data, as opposed to blindly following instructions. In particular, the company uses a set of machine-learning algorithms, collectively referred to as “deep learning,” that allow a computer to do things such as recognize patterns from massive amounts of data. Today, deep learning is a part of many products at Google and at Baidu, including speech recognition, Web search and advertising, Ng told Live Science in an email. Instead, companies like Google focus on making technology more helpful and intuitive. And nowhere is this more evident than in the smartphone market. In the 2013 movie Her, actor Joaquin Phoenix’s character falls in love with his smartphone operating system, “Samantha,” a computer-based personal assistant who becomes sentient. The film is obviously a product of Hollywood, but experts say that the movie gets at least one thing right: Technology will take on increasingly personal roles in people’s daily lives, and will learn human habits and predict people’s needs. For example, Google Now can show traffic information during your daily commute, or give you shopping list reminders while you’re at the store. You can ask the app questions, such as “should I wear a sweater tomorrow?” and it will give you the weather forecast. And, perhaps a bit creepily, you can ask it to “show me all my photos of dogs” (or “cats,” “sunsets” or a even a person’s name), and the app will find photos that fit that description, even if you haven’t labeled them as such. Given how much personal data from users Google stores in the form of emails, search histories and cloud storage, the company’s deep investments in artificial intelligence may seem disconcerting. For example, AI could make it easier for the company to deliver targeted advertising, which some users already find unpalatable. And AI-based image recognition software could make it harder for users to maintain anonymity online. While a phone that can learn your commute, answer your questions or recognize what a dog looks like may seem sophisticated, it still pales in comparison with a human being. In some areas, AI is no more advanced than a toddler. Yet, when asked, many AI researchers admit that the day when machines rival human intelligence will ultimately come. The question is, are people ready for it? In the 2014 film Transcendence, actor Johnny Depp’s character uploads his mind into a computer, but his hunger for power soon threatens the autonomy of his fellow humans. Hollywood isn’t known for its scientific accuracy, but the film’s themes don’t fall on deaf ears. In April, when Trancendence was released, Hawking and fellow physicist Frank Wilczek, cosmologist Max Tegmark and computer scientist Stuart Russell published an op-ed in The Huffington Post warning of the dangers of AI. Undoubtedly, AI could have many benefits, such as helping to aid the eradication of war, disease and poverty, the scientists wrote. Creating intelligent machines would be one of the biggest achievements in human history, they wrote, but it “might also be [the] last.” Considering that the singularity may be the best or worst thing to happen to humanity, not enough research is being devoted to understanding its impacts, they said. The first thousand-robot flash mob has assembled at Harvard University. The ‘K’ stands for Kilobots, the name given to these extremely simple robots, each just a few centimeters across, standing on three pin-like legs. Instead of one highly-complex robot, a “kilo” of robots collaborate, providing a simple platform for the enactment of complex behaviors. Just as trillions of individual cells can assemble into an intelligent organism, or a thousand starlings can form a great flowing murmuration across the sky, the Kilobots demonstrate how complexity can arise from very simple behaviors performed en masse (see video). To computer scientists, they also represent a significant milestone in the development of collective artificial intelligence (AI). Given a two-dimensional image, the Kilobots follow simple rules to form the same shape. Visually, the effect is similar to a flock of birds wheeling across the sky. “At some level you no longer even see the individuals; you just see the collective as an entity to itself,” says Radhika Nagpal. This self-organizing swarm was created in the lab of Radhika Nagpal, Fred Kavli Professor of Computer Science at the Harvard School of Engineering and Applied Sciences (SEAS) and a Core Faculty Member at the Wyss Institute for Biologically Inspired Engineering at Harvard University. The advance is described in the August 15 issue of Science. “Biological collectives involve enormous numbers of cooperating entities—whether you think of cells or insects or animals—that together accomplish a single task that is a magnitude beyond the scale of any individual,” says lead author Michael Rubenstein, a research associate at Harvard SEAS and the Wyss Institute. “We are especially inspired by systems where individuals can self-assemble together to solve problems,” says Nagpal. Her research group made news in February 2014 with a group of termite-inspired robots that can collaboratively perform construction tasks using simple forms of coordination. But the algorithm that instructs those TERMES robots has not yet been demonstrated in a very large swarm. In fact, only a few robot swarms to date have exceeded 100 individuals, because of the algorithmic limitations on coordinating such large numbers, and the cost and labor involved in fabricating the physical devices. The research team overcame both of these challenges through thoughtful design. Most notably, the Kilobots require no micromanagement or intervention once an initial set of instructions has been delivered. Four robots mark the origin of a coordinate system, all the other robots receive a 2D image that they should mimic, and then using very primitive behaviors—following the edge of a group, tracking a distance from the origin, and maintaining a sense of relative location—they take turns moving towards an acceptable position. With coauthor Alejandro Cornejo, a postdoctoral fellow at Harvard SEAS and the Wyss Institute, they demonstrated a mathematical proof that the individual behaviors would lead to the right global result. The Kilobots also correct their own mistakes. If a traffic jam forms or a robot moves off-course—errors that become much more common in a large group—nearby robots sense the problem and cooperate to fix it. Yet, at scale, the smart algorithm overcomes these individual limitations and guarantees—both physically and mathematically—that the robots can complete a human-specified task, in this case assembling into a particular shape. That’s an important demonstration for the future of distributed robotics, says Nagpal. For now, the Kilobots provide an essential test bed for AI algorithms. The Kilobot robot design and software, originally created in Nagpal’s group at Harvard, are available open-source for non-commercial use. The Kilobots have also been licensed by Harvard’s Office of Technology Development to K-Team, a manufacturer of small mobile robots. This research was supported in part by the Wyss Institute and by the National Science Foundation (CCF-0926148, CCF-0643898).